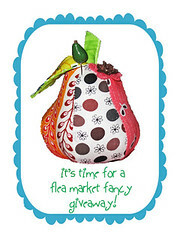 The Pin Cushion: GIVEAWAY TIME! 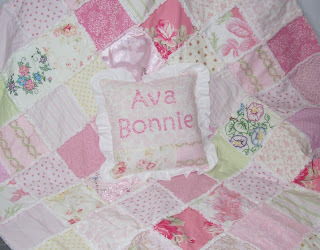 And a lot of quilt pictures. GIVEAWAY TIME! 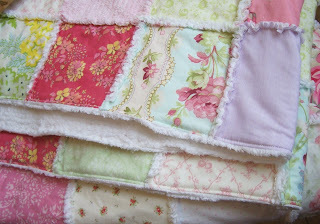 And a lot of quilt pictures. Eek! It's almost been two whole months?! I promise I've steadily been working away. I've even got the pictures to prove it. Baby #3 will be here any minute now (eek again!) and we've had to re-arrange the entire bedroom situation at home. The girls are now in one room together. Oh help me! For the first time I've really felt the desire to decorate my home in a beautiful way. Before things were just kinda hodge-podge. But now I have 2 UNNECESSARY pillows on my bed for a grand total of 4. I know, it's time I became an adult. Another thing I'm really loving is lighting. Being that hubs is in the electrical design world, I have to bring my A-game for any lighting suggestions. I must say that after months of looking around, CSN has some really cool, modern fixtures. I'm really wanting some pendant lighting for the bedroom. Our house is surrounded by tall gangly trees and never gets hot in the summer. Why all the ceiling fans?! Let's make this place gorgeous! 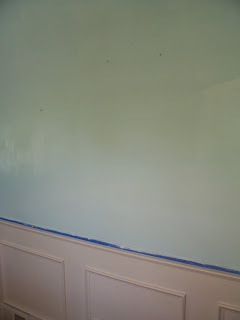 First coat of new blue walls. See! No room is safe here. But since it feels like I've been under a rock I want to liven things up and do another fantastic CSN Giveaway! Just leave a comment about how I get my girls to actually sleep at night instead of dance around until 10pm. :) OR tell me your current home dec project. It's spring, I know you're working on something. I'll pick a random winner next week who will receive a $30 gift cert to CSN for lighting purchases or whatever your little heart desires. 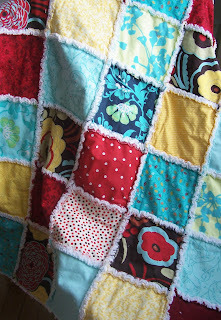 And now some of the quilts I've been working on the past month: An adorable twin patchwork commission. My girls were both sad to see me box it up. They were totally hoping it was for them. Sorry, girls. 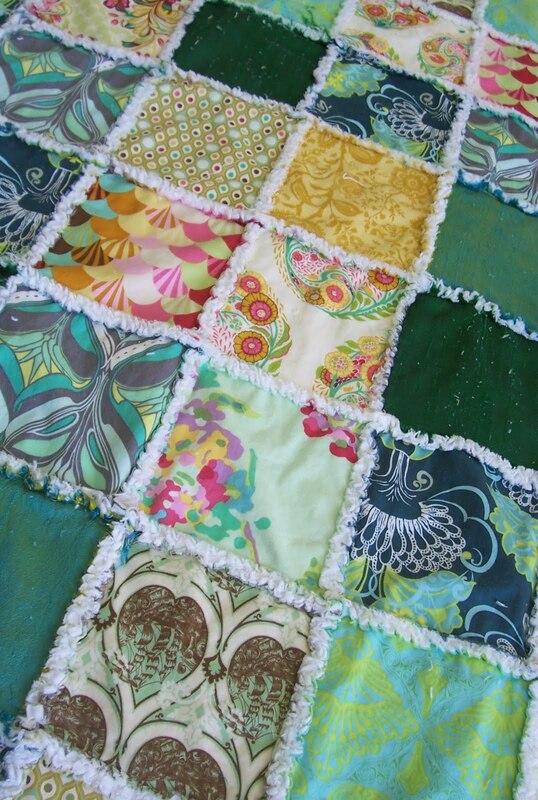 You'll get quilts of your own someday... And let the rag quilt mania begin! 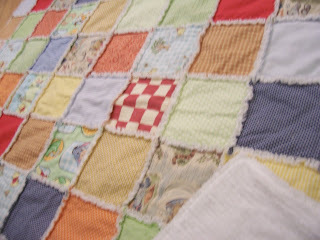 Being super pregnant, I was thrilled to pieces that so many people wanted rag quilts in my last trimester. Basting a quilt at 9 mths pregnant is just not a pretty thing. Oh! So I've started making pillows now and they are super fun. Yuck, blurry picture. Can I ask for a new camera for Mother's Day without seeming too demanding? Honey? Someone? Pretty please? Here we have rag quilt #736. Everyone adds their own special flare. Lavender, an old nightgown from grandma, pictures on fabric paper, etc. 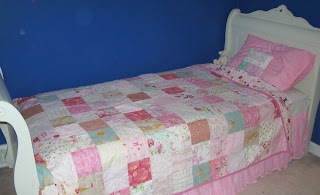 I love quilts! They all end up just right for their special people to keep warm and save memories in a very useful way. Maybe that's why scrapbooking never spoke to me. I can' t do anything with a book other than open it. Or fix a wobbly table. And the present creation - this client wanted to incorporate silks and velvet into her quilt. Mama mia! It is a texture party everywhere here! I'm so thankful to have had a wonderful start to the year. God continues to bless me richly with my growing family and fun little business. You just never know where He is going to take you. Don't forget to leave a comment for the CSN Giveaway! Happy Decorating and a blessed Lenten season. I LOVE your blog! You are too funny, and it always brings a smile to my face when I read your posts. It makes me feel like I am still back home with you. Our spring project is decorating the office since hubby is still working from home even though he has a new job. We are going to finally paint it, add valances, and install the fan that we desperately need since we have no trees and it gets extremely hot with all of the computers on and the sun shining in. Best wishes these last few weeks of your pregnancy. We cannot wait to meet Baby #3! Hoppy Easter! My spring project: cleaning out my closets. We're aiming to get rid of things we no longer need. I'm working on redecorating my kitchen. I'm working on reorganizing our too-small kitchen so we can get to things we need! We haven't touched our guest room since we moved into our home, so I would love to spruce it up with new linens, paint, and decor! Thanks for the giveaway!